When it comes to apartments, The Courtyard is a certain step above the rest! An exclusive development located within its own beautifully maintained grounds and gardens, it’s a stunning setting for anyone looking for peace and quiet, yet local to all you could need. This spacious ground floor apartment offers a gorgeous ready to move in interior where attractive décor and high-end fittings sit central to all that’s on offer. Entering through into the entrance hall, it will become immediately apparent the sense of space that is set to continue throughout, also coming complete with two large storage cupboards and doors leading into the open plan lounge and dining area, bedrooms and bathroom. The dining area opens conveniently into the lounge, offering fantastic versatility, whilst a door leads you through to the fully fitted kitchen, complete with all of the integrated appliances you could need. 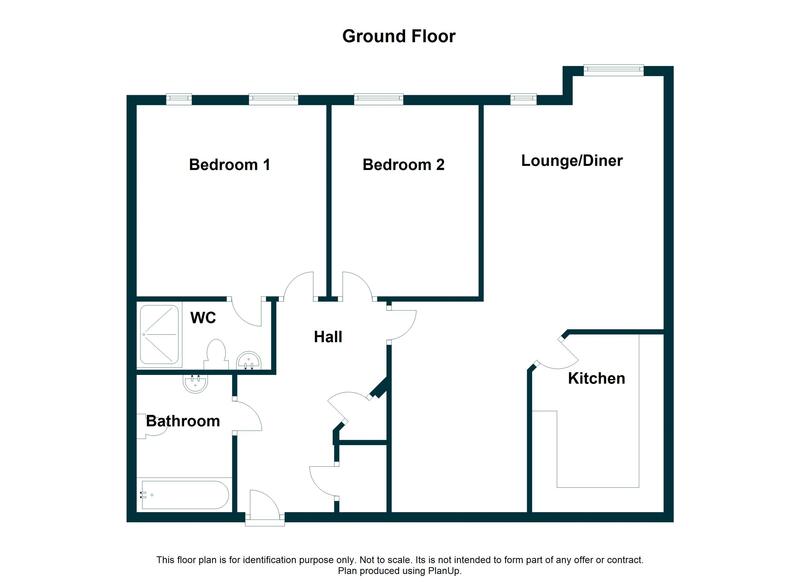 There are two excellent size double bedrooms, the master enjoying its own en suite shower room, whilst a further separate bathroom comes complete with a modern white three-piece suite. The building itself has an impressive main entrance and reception lobby with secure entry and there is also secure allocated parking plus visitor spaces within the grounds, which are there for everyone to enjoy. A large attractive lawn makes an ideal environment for those longing for the ease of no maintenance, yet still wish for outside space. An apartment ticking all of the boxes in our view! The suburb of Upton has fast become a sought-after district of Chester. Particularly popular with families wanting good quality homes offering gardens and parking with access to great schools. Within striking distance of Hoole's shops, bars and restaurants and a short drive into the City Centre, it's a central location for all. Upton also has a number of local convenience shops in several locations, parks and playing fields with local bus services and a railway station on the Chester-Liverpool line at nearby Bache. Secure entrance door with inset spyhole. Wall mounted intercom system. Doors providing access to two large built-in storage cupboards, one of which houses the gas boiler. Radiator. Ceiling light point. Internal doors lead into the two bedrooms, bathroom and open plan lounge and dining area. Radiator. Power points. Ceiling light point and wall lighting. The dining area opens directly into the lounge. Three PVC windows to the rear elevation. Radiator. TV aerial and power points. Ceiling light point. Internal door leads into the kitchen. The kitchen is fitted with a comprehensive arrangement of wall and base units, incorporating drawers and cupboards. The work-surface has matching upstand and houses a stainless-steel sink with drainer and mixer tap. Tiled splashbacks with inset power points. Integral appliances include an electric oven, separate grill, four ring ceramic hob with stainless-steel splashback and canopy extractor hood over, washing machine, dishwasher and fridge-freezer. Radiator. Ceiling spotlights and under-unit lighting. Three PVC windows to the rear elevation. Radiator. Power points. Ceiling light point. Internal door leads into the en suite. Fitted with a modern white three-piece suite to include a fully tiled double shower cubicle with sliding glass doors. Low level WC. Pedestal washbasin with chrome fittings. Part tiled walls. Shaver point and extractor fan. Heated towel rail. Ceiling light point and recessed spotlight. Three PVC windows to the rear elevation. Radiator. Power points. Ceiling light point. Fitted with a modern white three-piece suite to include a panelled bath with chrome fittings. Low level WC. Pedestal washbasin with chrome fittings. Half-height tiled walls. Shaver point and extractor fan. Heated towel rail. Ceiling light point. The property is positioned within a stunning setting of beautifully maintained grounds and gardens for everyone to enjoy. There is allocated parking, along with visitor’s parking within the grounds. The property is approached via an impressive communal hallway with secure entry. Proceed out of Chester along Hoole Road. Continue for some distance before turning left onto Newton Lane. Proceed along this road, over the bridge and past The Firs school on the left where Newton Lane will merge into Plas Newton Lane. The property will then be seen further along on the left side, indicated by our for sale board. View or download the Energy Performance Certificate for The Beeches, Upton, Chester.